Humans are stubborn. For music critics like myself, who pride themselves on being open, fair, and unbiased, that hypocritical stance becomes evident every so often. We pick and choose favorites. Readers of mine know a Kendrick Lamar release will be positive, a Vic Mensa one negative. Upon first listen of any new group, opinions are solidified, elaborated upon, and dug down deep without much wiggle room for where they'll be in the future. That's why King Gizzard & The Lizard Wizard's case is so glaring. In 2016, after a rising storm of hype concluded Nonagon Infinity one of the years best, the cyclical LP failed to get anything but a gimmicky reaction out of me. Therefore I brushed them off. And with the promise of five albums in 2017, quantity over quality assured, that general apathy rooted itself. But then Flying Microtonal Banana happened, and while that LP didn't flip the script, a second gimmick incoming, ironically, showed that King Gizzard wasn't gimmicky after all; they just had a trove of interesting ideas. With Murder Of The Universe, that line of thinking is confirmed. A wild, relentless ride through gushing fanfare by way of anarchistic spoken word prophecies makes Murder the group's best work yet. 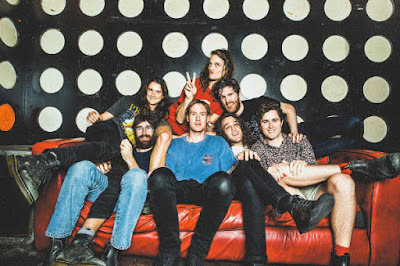 There's few bands making music today that abide by the same code of conduct King Gizzard enforces. That is, listening to any one album of theirs only gives you a sliver of what they're offering. Their talents reach far enough that compromising it all into one album just isn't enough. And yet, despite each album's foundation being drastically different, Murder Of The Universe included, this riveting expose into a lawless world feels more like a benchmark than another stepping stone. Composed of 21 songs across just 47 minutes, the compact epic traverses three distinct chapters with three distinct stories to tell. Theories abound, the best part of Murder's universe is that, whether intentional or not, it feels as if it was created primarily for the obsessive fans finding a linear plot unfolding throughout King Gizzard's discography. Fan service in music typically falls under two categories; disingenuous or redundant. It's either something they're returning to, or something they're continuing to do. With King Gizzard, their lunacy stretches so far that creating spoken word mayhem, somehow, constitutes the ultimate form of fan service. 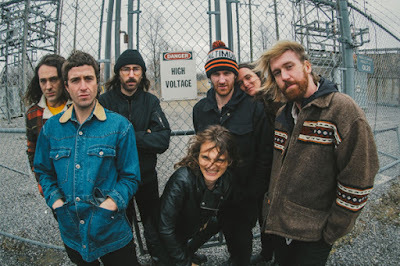 Not only that, inclusions of past works ('People Vultures' on 'Some Context,' Nonagon Infinity repeated with blaring confidence on 'Lord Of Lightning') exist too, solidifying that belief. What's perhaps most intriguing about Murder is how the LP is laid out. The continuous strain of free-wheeling bedlam, like a 16-wheeler scorching down a barren oasis of the Australian outback (a la Mad Max), causes the three chapters to feel instead like three lengthy songs. Imperceivable transitions cause moment to moment highlights to barrel along without a distinct indicator as to where they originated. The instrumentation is so dense, abrasive, and all-consuming that even attempting to break apart the pieces for further dissection would result in a cracked experience. And that's without mentioning the spoken word dialogue, beautifully handled by Leah Senior, which narrates the stories chronologically. Murder is a quintessential "the whole is greater than the sum of its parts" project. So much so that I couldn't tell you where, or when, my favorite moments occur. What I can deduce is that the pandemonium gleaming over the acid-drenched edifice acts as one continuous high for me. Influence pours in from the worlds of Psychedelic Rock, Garage Rock, Progressive Rock, even Country Rock, making Murder one of the more aggro-Rock records since the turn of the millennium. Insanity and chaos that's somehow contained. As much as the joy of musicianship can be enjoyed, and believe me it can, the spoken word segments are just as enthralling. The quiet tones of Senior's poetics offset the constant commotion and disorder, acting as a voice of reason and trust in this universe of wickedness. Better yet, with this credence in tow, when Senior imparts the fiendish details of a cannibal gone ballistic or a monstrous fight to the death, the sincerity of the tale feels authentic. It's as if she's imparting wisdom to future generations about what happened in the past. Not only that, her softness causes lines like "my left hand is a knife and my right is a fork, I will pull you apart like a butcher pulls pork" to feel extra tantalizing, and all the more savory. The stimulation of the spoken word does wear a tad thin by the third act though, when a cyborg named Han-Tyumi enters to disclose his fears of immortality and perpetuity. The story's unique, especially Han-Tyumi's obsession with humanity's grotesque lineaments, but the way it's handled, in conjunction with the mighty instrumentation that feels more or less tacked on here, cause the third act to be Murder's worst. The rolling percussion of 'Vomit Coffin' make for a worthy reward for being patient with King Gizzard though, as the shift in vibration is just the final punch Murder needed. What's interesting to note is that while Act Three features notables rising from the ash, Act Two's throat singing accomplishing the same, it's truly Act One, with no unusual instrumentation to speak of, that's most memorable. I'll likely attribute this to the paralyzing shock and awe, a feeling first felt when the nightmarish noise emerges on 'A New World.' Stu Mackenzie's back and forth songwriting, with segmented parts of 'Altered Beast' and 'Alter Me,' constantly keep you fluctuating between different stories of equally hectic tempos. It's like a rollercoaster composed of only drops and G-forces. Plus the act's conclusion, 'Life / Death,' might be King Gizzard's prettiest work yet, despite the Psychedelic melodies lasting no more than thirty seconds. A shame. Still, all that being said, Murder is one of the more wild musical experiences in recent history. I liken it to The Avalanches' Wildflower, not for reasons of sonic comparability mind you, but the fact that it seems removed from the constraints of time and the expectations of modern music. King Gizzard cements themselves as a band detached from it all, and Murder Of The Universe is clear, psychotic proof of that.